Start your visit of Florence at the magnificent Basilica of San Lorenzo. The church is located in the center of the market district and is, according to urban historiography, the oldest church in Florence. Among the most important works of the church is the fresco, which adorns the interior of the dome and shows the scene of the Last Judgment. In addition to the nave, the numerous side chapels can be visited. The main house also includes the adjoining, but by a separate entrance accessible Medici Chapel. By walking along the street Borgo S. Lorenzo you will reach one of the most famous sights in Florence: the Cathedral of Florence. It is one of the largest churches in the world and mainly famous for its dome from the 15th century. The dome is an incredible 107 meters high and has a diameter of about 45 meters. At that time, the construction of a dome of this gigantic size was technically not possible. That the dome was still completed, is almost a miracle. 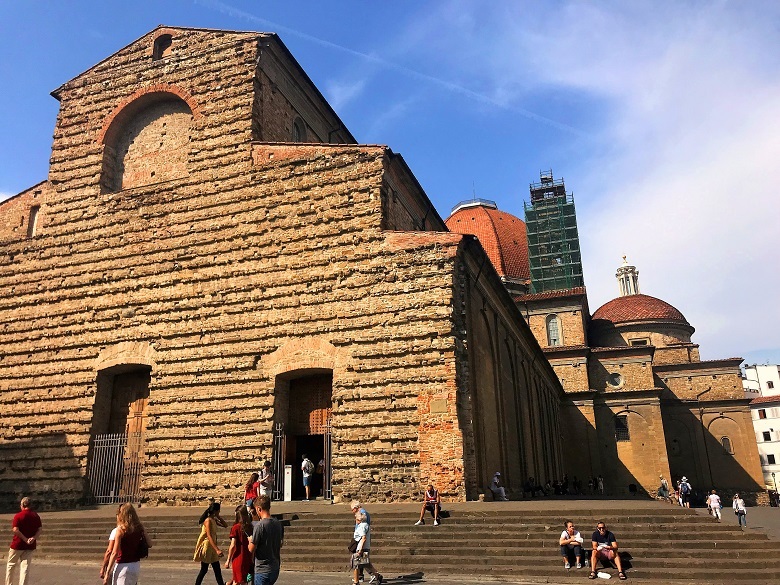 Next to the cathedral you can find Giotto’s Campanile, one of the showpieces of Florentine Gothic architecture, and the Baptistery of Saint John. Walk along the Via dei Calzaiuoli, till you reach another famous sight, the Palazzo Vecchio. It is a splendid palace from the 14th century, that was the center of secular power until the Renaissance. The imposing bell tower has a height of 94 meters and was completed after a 23-year construction period. The bell was rung to announce public meetings and warn of impending dangers. The interior of the Palazzo Vecchio dates mostly from the Renaissance. The most imposing chamber is the Salone dei Cinquecento. It is decorated with impressive murals by Leonardo Da Vinci, partly over painted by Giorgio Vaseri. Remember to buy the ticket for the Palazzo Vecchio in advance online, so that you don’t have to cue. Just next to the Palazzo Vecchio you can find the Loggia dei Lanzi. The covered gallery with three large arches was built between 1376 and 1382 by the Florentine architect Simone di Francesco Talenti and the Lombard-born architect Benci di Cione Dami. Today it houses a series of Renaissance and Roman sculptures and feels almost like an open-air museum. Just opposite the Loggia dei Lanzi, you can find the entrance to one of the Highlights of Florence: the Uffizi Gallery. The Uffizi Gallery was designed by Giorgio Vasari in the mid-15th century to house the city administration offices. The Art Gallery is located on the second floor of the building and was created from a core of the collection, which initially was just another room in the government office. The Medici family collected many ancient sculptures and contemporary paintings, most of which later became part of the artistic heritage of Florence. In 1789, the Uffizi Gallery opened its doors to the public. The Uffizi include paintings by Giotto, the famous Birth of Venus by Botticelli, three paintings by Leonardo da Vinci and one of Michelangelo. 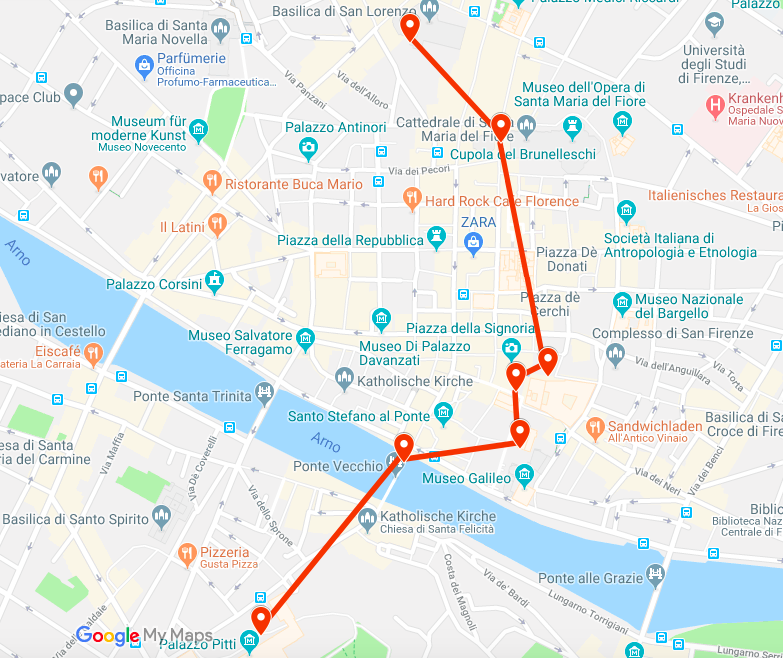 Remember to buy the ticket for the Uffizi Gallery in advance online, so that you don’t have to cue. When you come out of the Uffizi Gallery, head towards the Arno River. From there you have a nice view on the famous Ponte Vecchio. 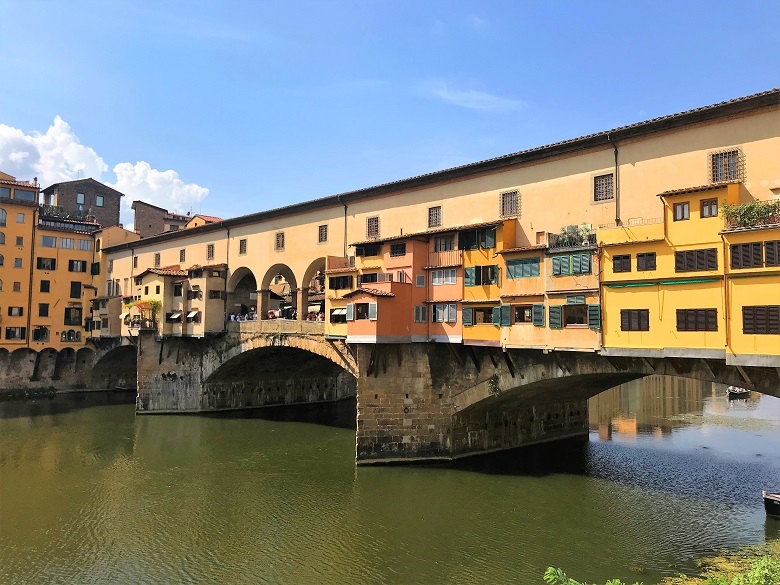 It is the oldest and most beautiful bridge over the Arno and was completed after 12 years of construction in 1345. At the beginning there were mainly shops of butchers and tanners on the bridge, who threw their stinking garbage into the Arno. In 1565, however, these were replaced by gold and silversmiths. Even today there are numerous jewelery shops on the Ponte Vecchio. After crossing the Ponte Vecchio, walk along the Via de Guicciardini until you reach the massive Palazzo Pitti. It is the largest palace of Florence and was designed around 1450 by Filippo Brunelleschi for the rich Pitti family. If you still have some time left, you can either visit one of the numerous museums of the Palazzo Pitti or the beautiful Boboli Gardens just behind the palace. After this tiering one day itinerary, you can relax a bit and stroll around the shopping streets, grab a bite at one of the great Italian restaurants or just enjoy a drink on a terrace.